Tuxco’s Model AF-5 has a unique, patented design that eliminates air and condensation contact with sensitive hydraulic brake fluids while setting new standards of portability and convenience. Made especially for aircraft servicing, it provides an important safety factor for military aviation facilities which have used it since 1970. It is precision built, using only the highest quality materials and workmanship throughout. 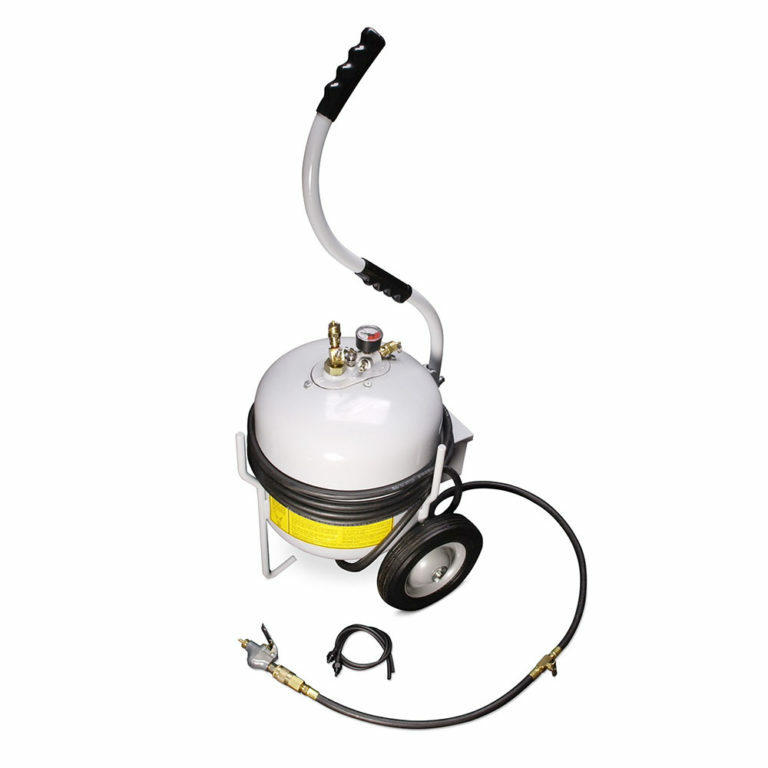 Different than all other equipment designed, for hydraulic brake fluid service, the AF-5 has a totally enclosed Buna-N bladder contained in a welded, one piece 13 gauge steel tank. There is no flange mounted diaphragm, thus no possibility of the tank leaking corrosive fluids. The tank has a capacity of 5 gallons. All metal parts are epoxy-finished in a chemical resistant gray. Air pressure is maintained in the bladder in order to eject oil from the tank. The bladder expands to approximately the same size as the tank and nearly occupies the entire tank’s volume when the fluid supply is exhausted. The bladder exerts pressure against the oil and forces it out at the bottom of the tank into a hose from which it is ejected through a trigger controlled nozzle, which is attached to an appropriate adapter. The AF-5 weighs 40 lbs. empty…80 lbs. when filled with oil. The unit is transportable in two ways. It is easily wheeled or lifted by means of the uniquely designed handle which is located exactly over the center of gravity. All necessary equipment is included with the basic unit. Twenty feet of dispensing hose, equipped with quick connectors, ready for use, wraps conveniently on a rack. An enclosed tool box, which is attached, contains the trigger gun, O-ring seals, and aircraft adapters.